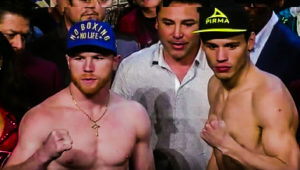 Canelo and Chavez JR both make weight ahead of PPV Clash! On the March 2012 cover of “The Ring” magazine, Saul “Canelo” Alvarez and Julio Cesar Chavez JR, stand in fighting poses, underneath is a caption that reads “IS THE TIME NOW?”. Since it’s five years and two months later, obviously promoters felt that was not the time. In 24hrs though, at the Las Vegas T-Mobile arena despite if that was the time it should have taken place, Saul “Canelo” Alvarez and Julio Cesar Chavez JR will meet. When that issue of “The Ring”, was released both fighters were undefeated world champions. At the time Julio Cesar Chavez JR was boxing’s WBC middleweight champion, Saul “Canelo” Alvarez the WBC junior middleweight champion. A short while later, in his biggest step up bout, Chavez Jr outside scoring a 12th round knockdown, would be dominated by then middleweight king Sergio Martinez. 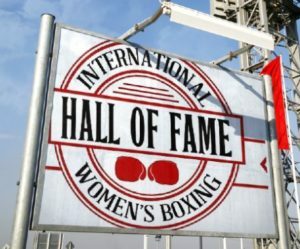 As for Canelo Alvarez, he would score multiple victories, claim another world title with a decision, over then WBA 154lb title holder Austin Trout. 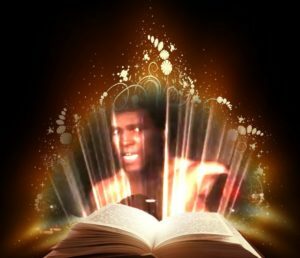 Then face boxing’s, “Pound for Pound King” Floyd Mayweather Jr on September 14th 2013, he too would be dominated, despite questionable scoring that ended in a majority decision loss. The two fighters, would go in opposite directions after their first losses. A jump in weight for Canelo, claiming the middleweight title from Miguel Cotto. Then after refusing to face Gennady Golovkin, he vacated that championship returned to junior middleweight, claimed another title belt stopping Liam Smith while becoming a huge pay-per view draw during the process. As for Chavez Jr, bad training habits and lack luster performances against journeyman Brian Vera, led him to lose public support. If that was not enough, a knockout loss at the hands of Andrzej Fonfara at light heavyweight in 2015, seen his star virtually fade. In 2016 Chavez Jr returned, to claim decision victories over durable fighters Dominik Britsch and Marcos Reyes (Who will face David Lemieux on the undercard at a 163lb Catchweight). Even with those victories, Chavez Jr failed to convince fans he was on the return to former glory. With Canelo vacating his middleweight title, after refusing to face middleweight kingpin Gennady Golovkin, despite promising the public. The two fighters finally, have decided they are going to give the public what was asked for five years ago. The big question, leading up to the fight has been “Will Chavez Jr be in shape? 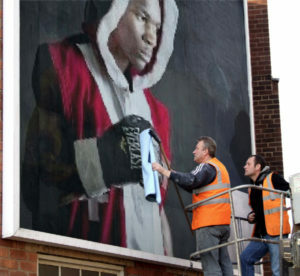 Can he even make the super middleweight maximum of 168lbs, let alone a Catchweight of 164.5lbs?” While rumors circulated he was not training as he should, others that he was training harder than ever, we were given our answers when they hit the scales Friday afternoon. The two fighters entered to loud ovations, Chavez Jr had more supporters than expected by most. The crowd seemed to be 60/40 in favor of Canelo and that 40% seemed to surprised even bother him. Up until that point, Chavez Jr had been covering up with sweats in public, helping fuel the rumors he was not in top condition. Once he stripped down to his underwear, any doubters in person or watching were suddenly quiet. 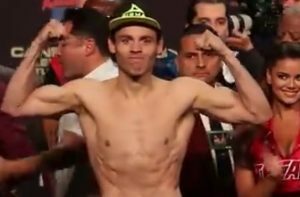 When the official weight was announced, Chavez Jr not only made the contracted weight limit of 164.5lbs, he weighed a half pound under. As did Canelo who also weighed in at 164lbs even. 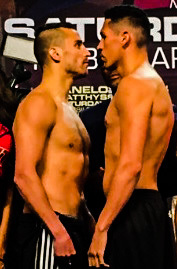 The only difference between the two, aside from a substantial height advantage for Chavez Jr, was bulk. It was Chavez Jr who appeared leaner. 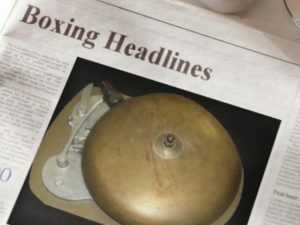 It was Canelo, the former middleweight belt holder who claimed to be a “Junior Middleweight”, his reasons for vacating his WBC 160lb strap that had the muscle bulk. In the faceoff, Canelo seemed more intense, looking up at Chavez Jr with bad intentions in his eyes. The body language of Chavez Jr appeared confident and relaxed. When the stare down was over, Canelo gestured towards the crowd, Chavez Jr strolled off stage and began to speak with his father both appearing to be in a jovial mood. What was peculiar is the fact, Canelo took to drinking electrolyte’s almost immediately as if dehydrated. If Chavez Jr did once out of site we don’t know but any questions on his condition, at least in terms of weight have been answered. PPV Undercard bouts official weights. Welterweight bout. Lucas Matthysse- 37-4 (34) 147lbs. Emmanuel Taylor- 20-4 (14) 147lbs. 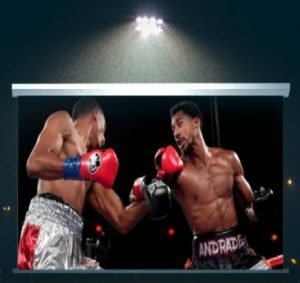 Don’t forget to tune in and watch the Talkin Boxing With Billy C PPV Post fight show starting 10min after the main event winner is officially announced.